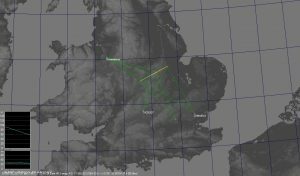 At 03.52 on the 30th of March 2019 a very bright fireball was detected by a number of observers around the UK. As well as visual observations, the fireball was picked up by multiple stations in the UKMON & NEMETODE networks and by the newly-installed Scamp system. The video below shows the view from one of my meteor cameras in Oxfordshire. Multiple detections enabled quite detailed analysis of the object. William Stewart of NEMETODE calculated that the object weighed between 190 and 330g, was of asteroidal origin and was between 36 and 60mm in size. 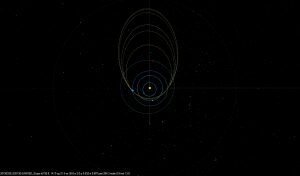 The flight path and the meteoroid’s original orbit were also calculated (see below). This is a great example of the real science that can be done with meteors, and of great collaboration between UKMON, NEMETODE and Scamp to help generate that science. Now, if only one of these would fall over land…. Data collected by Nick James, Jim Rowe, William Stewart, Mark McIntyre and others.